But first…..my disclaimer. This is what works for me. Feel free to try any of my suggestions but ultimately you have to find what works for you, your own template for life. I have tried and tested many tools and resources over the years. Next year I’ll be tweaking my template again as I continue to learn new ways to bring more health and happiness into my life. Theme – Each year I choose a word or phrase that allows me to simplify my life. It’s especially helpful when life get busy or I feel a little unfocused. This year I’ll be having my first baby so my theme is ‘luminous’. I want that glow, yes even when I’m up all night feeding…I WILL…GLOW! There is more to it than this but ultimately it’s about aligning my actions with feeling luminous. Feelings – I choose 5 to 7 words that describe how I want to feel this year. This year I want to feel …Energetic, Pleasure, Nourished, Winning and yes…Luminous. This idea was inspired by ‘The Fire Starter Sessions’ audio book by Danielle LaPorte. I could talk about aligning your feelings with your goals for hours. Values – I keep a list in my diary of the most important things to me. It helps me make decisions. My top values are Health, Happiness, Family, Friends, Growth, Creativity and Finance. Top 3 Goals/Intentions – I focus on 3 big goals. In the past I have had too many goals and felt like I wasn’t making the progress I wanted to. It’s way more rewarding achieving 3 big ones instead of chipping away at 20. It’s like running a marathon and never getting to the finish line to celebrate. Daily Rituals – These are mini practices that nourish me and symbolise self care. My staple rituals are; warm water and lemon first thing in the morning, a relaxed morning coffee, 15 minutes mindfulness meditation and my beloved happiness jar. Mantra’s – I use mantra’s to get my mind back in the game. E.g ‘I am deeply fulfilled by my work and I am paid well for it’. I have about 5 on hand for different situations. I would suggest you create your own, using your own words feels more powerful. 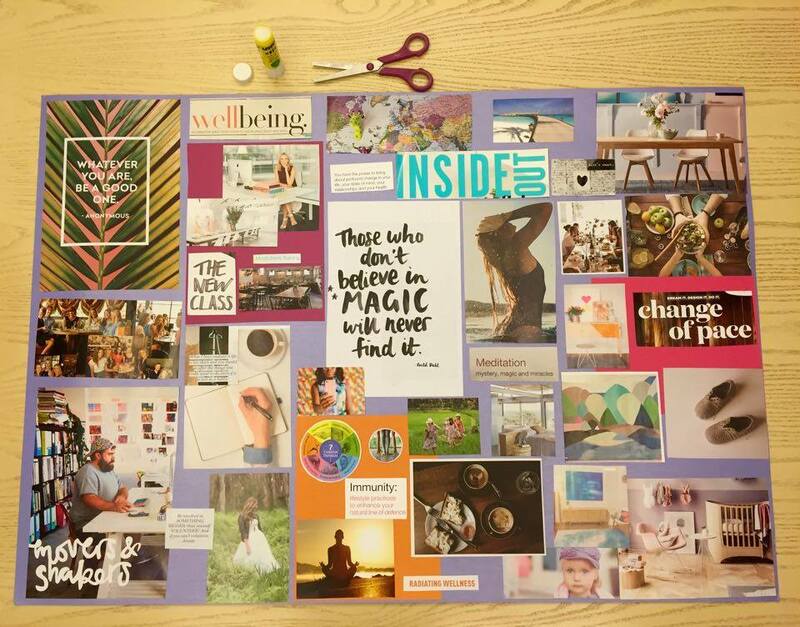 Vision Board – I absolutely love the creative process of doing a vision board. I consider it more an exercise to expand my mind for possibilities rather than something ‘woo-woo’. My board sits on my desk and it’s a colourful reminder of what I’m working towards. New ideas are often generated from it. This year I have put my business and personal vision on one board because for me it always seems to overlap. My hobbies and interests are closely aligned with my work. Personal Diary/Planner – This is the second time I have used Passion Planner. I absolutely love it! It has a week-to-view page layout with a ‘personal do-to list’ and a ‘work to-do list’. It also has a review section at the end of each month. Business Plan – For the first time I am using Leonie Dawson’s Shining Workbook for Biz. Many women I know personally and professionally have had great success using her resources. It’s colourful and pretty and appeals more to women. I’ve chosen the e-book to work from because it’s convenient for me. For $10 US it’s incredible value. It’s got both structure and spirituality. I do like a little mystic and magic. You also get access to a Facebook support group. And that’s how I keep my vision alive and stay focused!